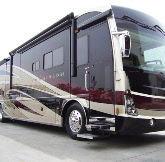 Get the latest in RV & Boat world news from our resident RV’ers as they share where they are going who they are hanging with and how much they love RV & Boat Storage of Rialto! We are parked on I-81 in the state of Virginia. Freeway is completely stopped. It is kind of odd. The traffic going the other way is going full speed. We have had breakfast, read most of our e-mails, brushed the dog, etc. I was going to call the office awhile ago but realized we are in eastern time zone and you guys weren’t in yet. That is kind of a strange feeling, since we have been up since 6:30 this morning 4 ½ hours ago and the West Coast hasn’t started work yet. Also kind of strange to see people walking up and down the freeway. I just heard from one of the folks in our group that is ahead of us, that this freeway stoppage may have something to do with them decorating an overpass for the upcoming memorial day parade or something. Email us your stories and photos and we will feature you in our blogletter!